Microsoft have recently unveiled their latest operating system, Windows 10, expected to be released mid to late 2015. Being a Microsoft Gold Partner, IMEX received a preview copy and have been testing now for almost a month, and so far we are pretty impressed. So firstly, why the name Windows 10? The choice naturally would have been Windows 9, but Microsoft is keen to promote a break with the past and an incremental product update. Since its release of Windows 8, Microsoft have had a vision of all devices running the same OS, this kind of worked but it had its issues. So, for Windows 10 Microsoft are pushing this ethos harder and further, while initially they have only demonstrated the desktop version, it will eventually be available on a wide range of devices, from phones and tablets to PCs and Xbox games consoles, with applications sold from a single online store. Windows 8 wasn’t the most popular incarnation of Windows, the removal of the Start Menu and the lurch towards a touchscreen centric design seemed too much for desktop users. Most users complained that while Windows 8 was usable, it was not as efficient or as intuitive as before. Some of this confusion was caused by the separation between its two User Interface models, with traditional desktop apps and the new “Modern Desktop” running in separate containers. 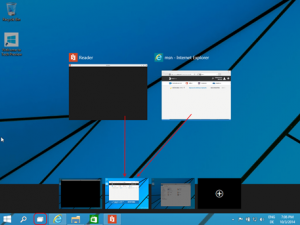 Windows 8.1 started to address this by blending the two ways of working, but Windows 10 completes the job, mixing the two on the familiar Windows desktop. 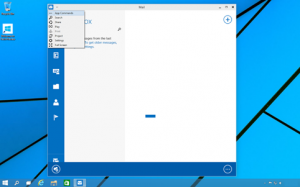 The start menu now displays a more traditional list of the user’s favourite applications (Win7 style) but, in addition, you will also see resizable tiles alongside it, tiles similar to the Windows 8 phone interface and the Windows 8 touch interface currently on PCs and tablets. The tiles provide another area of shortcuts to open your apps and are actually live, giving an instant view of notifications from relevant applications, such as details of new emails, weather forecast updates and social networking – something Windows Phone 8 users will be familiar with. The new PC desktop may not be as colourful as the Windows 8 start screen, but for productivity-driven and business users that felt the live tiles were a waste of space, the return to the old user interface is a welcome improvement. 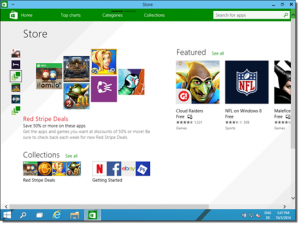 Modern Apps are lightweight applications introduced with Windows 8. They are different from traditional x86 applications as they use less memory, are easily ported to Microsoft’s other platforms such as Windows Phone and Xbox One. Modern Apps are also much safer than traditional applications as they can only be installed via Microsoft’s Store portal. Therefore, they don’t present the threat of possible malware due to stringent testing before being permitted by Microsoft to be downloaded. The main complaint regarding Apps was, when opened, would switch you to the “Modern UI” view, run full screen and could not be resized. Most users found this duel personality made Windows 8 less intuitive and frustrating. Windows 10 has changed this by allowing Modern Apps to run in windowed mode on the traditional desktop (no switching to Modern UI). Also title bars have been added allowing you to resize, minimise and close, as well as a menu button which provides quick access to App Commands and other functions. These changes allow users to essentially treat Modern Apps like any other application on the desktop. 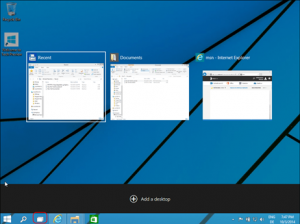 Also good news, is that all existing Apps will work with Windows 10. While the Windows Store is still lacking the diversity and selection of stores such as Apples iTunes and Google Play, it has grown at a fantastic rate since Windows 8 was released, and should be even more competitive in a year’s time when Windows 10 launches. Especially with the potential for the same App to be run across multiple devices. Multitasking is one of the Windows operating systems best features and Microsoft is now adding “Task View” to make it even more useful. Sat on the taskbar at the bottom of the screen, task view when launched, will display all of your currently opened apps. When you launch task view, Windows 10 will also allow you to view multiple desktops – a feature already well-established on Apple and Google Android platforms. Microsoft has received a lot of flak since it released Windows 8 and for the most part, rightly so. Microsoft seems to have listened to its customer base, reversing some of the poor decisions made previously by pushing forward in creating an operating system which will enable users to be productive, and also enjoy the benefits of a unified interface across all devices. 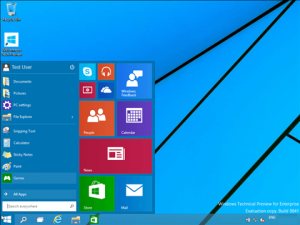 Windows 10 is far from finished. Sources at Microsoft claim that the technical preview only contains 10 percent of the improvements which they are planning, so we look forward to testing more previews during the coming months and reporting back. The pricing model for Windows 10 has not yet been announced, but there are rumours that it will be a free upgrade from Windows 8!